Learn to spray tan with Perfect Glow Sunless. This is a beginner/Intermediate training. Please note that This certification is just through Perfect Glow Sunless which is a private company. We are not accredited through or with any state, federal , government or health accredited agency. You are responsible for finding out your states requirements as to what they require for you to start up your spray tan business. I have been in your shoes and have created this online training to answer many of the questions most people have when starting out or did not get proper training. This is a very detailed online training . You can not learn to spray tan from YouTube or from joining multiple Facebook groups. it will take a long time as well as overwhelm you by giving conflicting information. Plus many of the members are new to the industry themselves & not properly trained. All about dha and different % levels. You need to know how to spray with just more than one level! There are training classes popping up all over the place by people very new in the industry. Do your research and learn from someone with years of experience & a proven portfolio and testimonials. This course was so simple to follow. Fulk of valuable information. I loved how much detail was put into the training. No steps were missed. I'm so excited to add this service to my salon. Thanks so much to Melissa and Perfect Glow for helping me achieve this goal. I highly recommend this course. And Melissa is so helpful when you need her. Excellent customer service. Great training! I have owned and operated my spray tanning business for four years now and am constantly looking for ways to stay educated. When I found out Melissa offered an online training course I immediately signed up. Melissa covers client prep, skin typing, a video tutorial and so much more. Best of all Melissa offers a 30 minute follow up phone call to go over any questions you might have. I found the follow up to be incredibly helpful as Melissa has so much advice and incite to offer. I would highly recommend this course it is worth every penny! Hi Melissa, It was such a pleasure speaking with you today!! I greatly appreciate all your advice and tips! 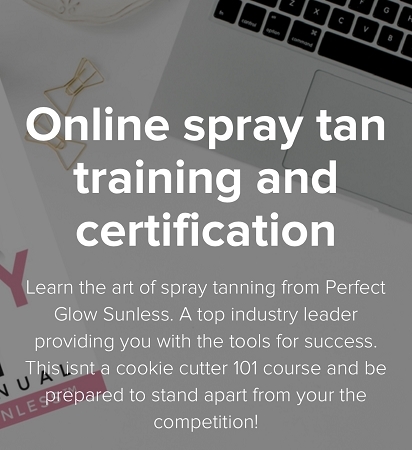 Your online course was extremely detailed and covered many in depth topics that I know will help me succeed as a mobile spray tan technician. I was very impressed with your online course and highly recommend it to anyone starting a spray tanning business! I'm very happy I came across your training program as it was very beneficial for me and my business!!!! To top it off, the 30 min phone consultation was everything I hoped for. It was a pleasure speaking with someone as successful and knowledgeable as you are. Thank you for taking the time to answer all of my many questions! You seem to really care a lot about your clients!! I can't wait to try your products out! LOVED this training course! Very concise and easy to understand. I learned SO MANY NEW THINGS!!!!! 10/10 recommend for anyone wanting to learn how to spray tan!!! I loved going through this certification. It was very easy to understand and the information was very thorough! Melissa’s training was so SO helpful. I have been a Spray Tan Artist for almost 3 years and not that I didn’t already have the knowledge, there is ALWAYS more to learn. Her training was incredibly helpful, specific, extremely detailed and covered any questions you may have. I was still able to learn more information beyond what I already knew. 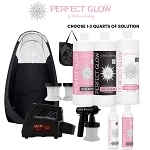 I have been using Perfect Glow Solutions for a while now and my business seriously wouldn’t be where it is without PG!! I truly, truly mean that. Once I became familiar with her solutions and started using them on every client my business sky rocketed. I am so confident in myself using her solutions and having the knowledge by taking her course. I 10/10 recommend taking the course and using PG solutions for your ‘go to’ solution. I don’t where I would be without Perfect Glow in my life!!! Thank you to the whole PG team for being so helpful and quick to respond to any questions or concerns I have! I started spray tanning almost 4 years ago. I love learning new things regarding spray tanning so I enrolled in this course as it was all online and self-paced. It was the perfect refresher and confidence booster that I needed. I even changed my entire spray pattern technique and like it a lot better and I’m receiving more compliments from clients. It was the perfect refresher with a lot of detailed information. Highly recommend! I have been spray tanning for over a year but still found that I learned many things in the online spray tan course! I couldn't love this company more. All the ladies are here to help you and are so positive and encouraging. 100% recommend this course for anyone starting out in the industry or wants to brush up their skills.